"A cheerful heart is good medicine ... "
By the term "mascot" we understand this to mean a person, animal, or object adopted by a group, such as an athletic team, to bring them good luck. One organist happens to have such a character perched on top of his big console at home that he looks upon as a mascot of sorts, a Disney character based upon the main character in Victor Hugo's immortal classic novel "Notre Dame de Paris (NDdP)" a book later renamed and better known as "The Hunchback of Notre Dame." 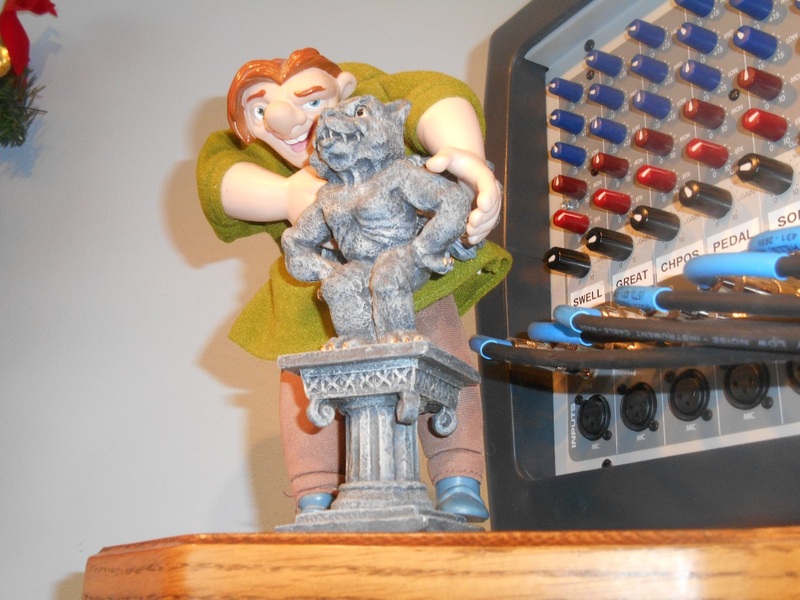 This character Quasimodo, or "Quasi" for short, has to be carefully watched; he stands on top of the console, tries to hide behind his friend (a horned demon in stone), and he's full of mischief. It all started back in the mid-14th century when Quasi was not just the bell ringer of NDdP but he also had to pump air into the big, clumsy, loud Blockwerk organ of the church to make it work; the organist at the time wanted to make an impression on the visiting clergy and so he wrote a note to Quasi who had been slack on pumping the organ air and handed it to him just before the worship service started. Quasi, making a natural mistake, handed the note on to the visiting priest, who opened it; the note read, "Keep blowing away until I give you the signal to stop." This brought a scolding from the organist, and Quasi never forgot it. Today Quasi tries to distract the organist when he's playing to get HIM to make a mistake; if that doesn't work, he retires a stop or draws an unwanted stop when the organist isn't looking; if that still doesn't trip up the organist, he unplugs something. With Quasi around, ever ready to play tricks, ever poised to distract, if the organist can play it all the way through at concert tempo without mistakes, even when some inexplicable glitch gets thrown in, they've truly learned the work. Quasi seems happiest when he's high in the air doing his acrobatics where no one else dares to go, ever trying to get even with every unsuspecting organist, and yet, he's perfectly safe where he is; the dizzying parapets of the console are his home, he's strong as an ox, and the way he scales the stop jambs like a spider and swings on those gig cables and speaker wires with predictable surety and ease, no one need worry about him falling. Seriously, while Quasi may not meet the dictionary definition of a mascot because he's a fictional character adopted by one person rather than a group of people, still, there's nothing wrong with us placing our favorite figure like this on the console as a reminder of a favorite teacher who had an equally kind heart and the many things we learned from that teacher, someone who helps us learn to laugh at perfection, someone who helps us seek excellence and reminds us that we've always got someone, night or day, who's present in spirit and interested in what we're doing at the keys, even if that someone doesn't understand much about it and is mostly deaf. Ask Quasi if he's fond of music and he'll be inclined to nod his head in the affirmative; we can also imagine him adding, with excitement in his voice, " ... but go right on playing anyway!" ... followed by a burst of laughter. That's just his sense of humor bleeding through; and it has much to teach us. We can't take ourselves too seriously in this life; we have to have a little fun, too.